Organic heirloom tomatoes have begun to show their lovely colorful faces around here, and when they do, I can’t resist them. I love tomatoes regardless of their size or shape as long as they haven’t been sitting in a cold storage box somewhere, rendering them flavorless. When the odd looking heirlooms are available, I have to have them. Deciding what to make with them once they’re sitting on my kitchen counter is an afterthought most of the time unless the sun has been shining and warm weather food is on my mind. Then I know what I’ll make. In fact I’m somewhat wired to think about a particular recipe whenever I see tomatoes like this. Because I have this tomato addiction, I’m going to try to grow my own this year. Of course I’ve grown my own tomatoes before, but as as much as I can mention that the sun shines and shines here most of the year, the position of our house and the height of our neighbor’s trees provide me precious little sunlight to plant vegetables in. The space I do have is covered with flagstones, so the tomatoes I plant will have to love growing in pots and climbing like vines. I saw gorgeous fresh San Marzanos at open air markets when we were in Rome last summer and then packages of seeds in several Sorrento shops, but I was too skeptical to buy them and then lose them in customs on our way back home. I promised myself I’d have some before this next summer had passed so I just bought the seeds here. Hopefully they won’t mind sharing space with a few heirlooms. Then I’ll have homemade tomato sauce and lots of pasta with fresh veggies. This recipe has a no-cook chunky tomato sauce with fresh basil oil if you’re inclined to make your own. It’s one of my favorite recipes. 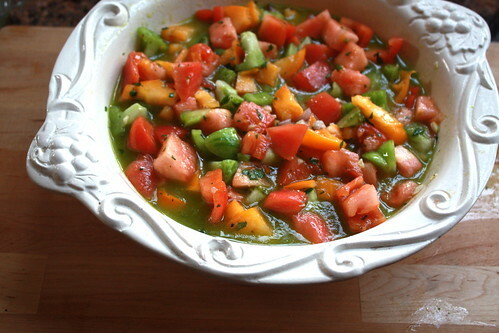 Mix the chopped tomatoes with the shallots, garlic, parsley and lemon juice and mix well. Set aside to make the basil flavored oil. 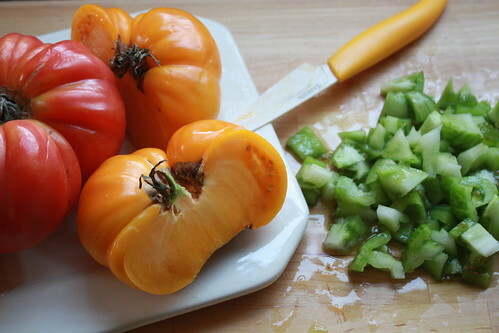 After the oil is made, pour it over the tomato mixture, mix well, and season with salt and pepper. 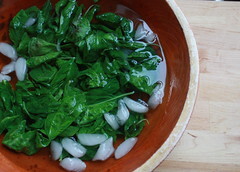 Blanch the basil leaves for a quick 5 seconds in a pan of boiling water, pushing all the leaves beneath the surface. Quickly scoop them from the water and dunk them in an ice bath to stop the cooking. 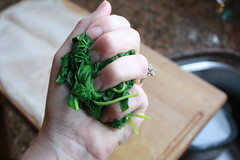 Drain and then with your fist, squeeze all the water from the basil. 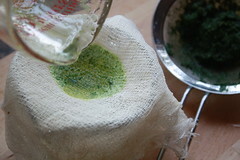 You may also wrap the basil in several layers of cheese cloth and squeeze out the excess moisture. 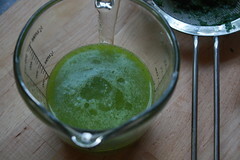 In a blender or food processor, puree the basil with the olive oil, then pour through a fine-meshed strainer, pressing on the basil to remove as much oil as possible. Finally, pour the oil through several layers of cheese cloth to ensure that the oil is well-filtered. 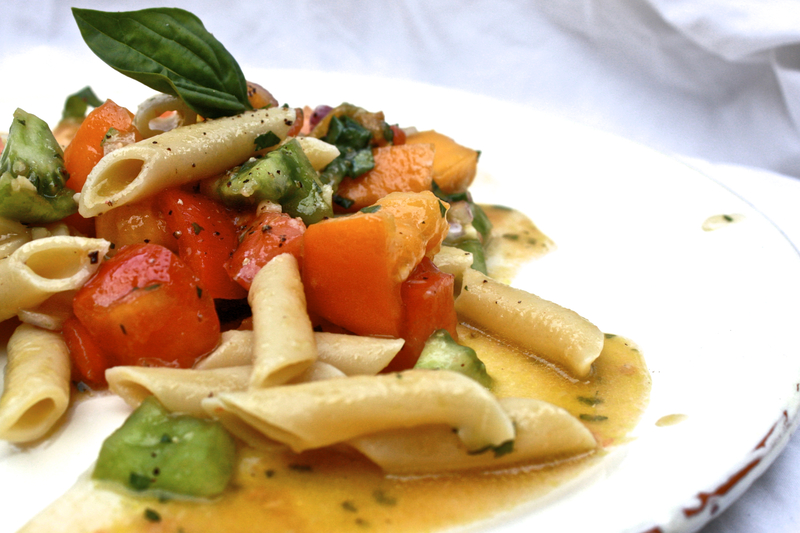 You should have about 3/4 c. of basil flavored oil. Drain the pasta and pour into a large shallow bowl. Pour the tomato basil mixture over it and add about half of the grated Parmesan. 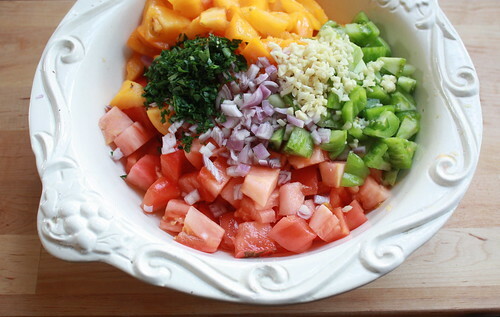 Mix well and taste to correct seasonings. Let sit at room temperature at least 15 minutes. Serve with a sprinkling of Parmesan. For a printable version of this recipe, please go here. 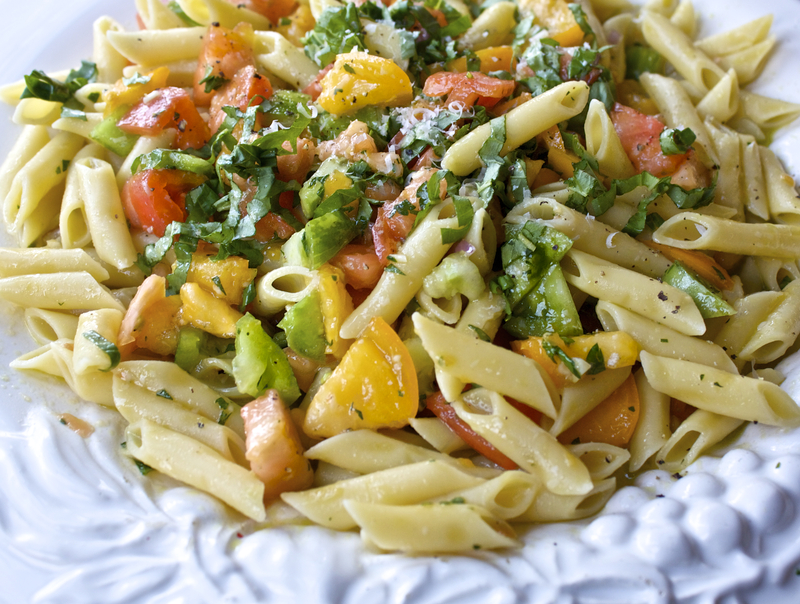 This recipe is best when made with ripe home-grown tomatoes. The quantity of tomatoes is easily adjusted according to your liking. We go heavy on the tomatoes. The fresh tomato sauce is best at room temperature but is also good heated. To do so, we just put a serving into the microwave until it’s hot. Easy. I use a micro planer to grate my Parmesan, so 1 cup will be almost nothing compared to the same quantity using a larger grater or packaged grated Parmesan. Just a consideration. 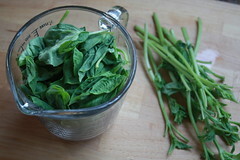 This recipe is great with lots of chopped or thinly sliced basil mixed in as well. If you can find a good basil flavored oil, by all means, use it instead of making your own. Not all brands are great, so choose one you’re familiar with. If you increase the lemon juice and add some nice olives, this is a great pasta salad in the summer. If you want some protein, then grilled sliced chicken also is excellent mixed in with this.